﻿What better inspiration for artful expression than a visit to a state park? ﻿Grab a paintbrush, crayon, easel, musical instrument or camera and head to a Texas state park to join the fun of the Arts in the Parks program. Whether through drawing, photography or music, this new Texas Parks and Wildlife Department program aims for Texans of all ages to connect with the outdoors through art. To kick it off, Texas state parks are partnering with the Get to Know organization, which strives to foster connections to nature through art. Together, they launched the “Get to Know” Texas State Parks Youth Art Contest. The contest lasts until Nov. 1 and is open to anyone under 19. Participants are invited to create original works of art inspired by nature (such as animals, plants or a landscape) at a Texas state park. For art contest and Arts in the Parks information, visit www.tpwd.state.tx.us/state-parks/programs/arts-in-parks. All submitted entries will be featured online at the Texas State Parks Gallery, www.get-to-know.org/gallery/2013-texas-state-parks. The gallery already features some wonderful artistic interpretations for your enjoyment. Contest participants will also get a chance to win prizes at the national level. Prizes include digital cameras, art supplies, binoculars, fishing rods, writing supplies and more. Participants can also win special Texas prize packages that will be announced later. Art in our state parks isn’t a totally new concept, when you consider events like the musical Texas and TPWD’s 2013 State Parks Photo Contest. Texas is performed every summer at Palo Duro Canyon State Park, and this year marked the show’s 48th anniversary. The musical details the struggles and stories of Texas Panhandle settlers in the 1800s. 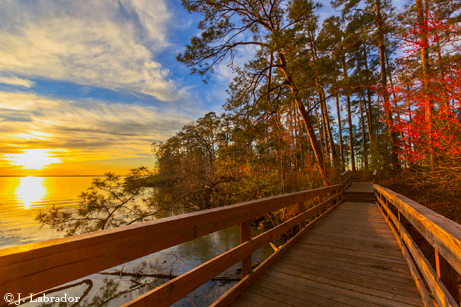 ﻿The State Parks Photo Contest produced a winner from Lake Livingston. See the winners and other great entries at www.tpwd.state.tx.us/photography. Many state parks are participating in the Arts in the Parks initiative, planning special events for visitors all year long. For example, on Oct. 19 at 10 a.m., Dinosaur Valley State Park in Glen Rose will offer “Lost in Landscapes,” a special session on freelance drawing from artist Holly Fisher. To learn how to capture the beauty of nature in a sketchbook, bring your chosen medium: drawing pencils, oil pastels/soft pastels or charcoal. The park will provide the atmosphere and instruction. When you go to experience art in a state park, don’t forget that kids 12 and under get free admission to all state parks, where they can also enjoy hiking, swimming, biking, fishing, stargazing and wildlife viewing.